Happy Monday! I hope you had a great weekend! My weekend definitely deterred from what I originally had planned but I took that the to simply relax and just let my mind and body rest. Sometimes those rest days are just what we need to get recharged and refueled for the upcoming week. If you follow me over on Instagram (if you're not following me, you definitely should! 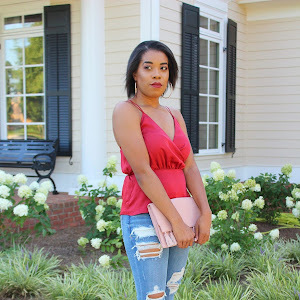 @chaneyajoyner) I'm always sharing super affordable clothing. I never want to share something that the average woman can't get her hands on, or not share another option of something I'm wearing. One of my TOP places I love to shop is a online store called Boohoo. This is a UK based website that has hundreds of pieces of clothing and contains so many styles. They constantly have coupon codes for money off and currently they're having 60% off their entire site including sale items. Boohoo has also started using AfterPay. AfterPay is a service that enables you to pay for your purchases over four equal installments that are interest free! You can always check out AfterPay's website to see what other retailers offer this service. I've recently placed a large order to add some new pieces to my wardrobe and thought I would share them with you today. Now on to the clothes! I've never been much of a hat person but I loved the color of this one. If it doesn't work out, they have a great return policy! I've been on a scarf kick recently and loved how this one was in a neutral color. Dalmatian print has been my print for Fall so I knew I wanted this one in my closet. This also comes in white which I also snagged! These are obviously something I can't wear currently but I'm slowly starting to work on my Spring and Summer wardrobe. I snagged these before they got popular and sold out in my size! I love to incorporate color into my wardrobe during the warmer months so I loved how bright this sweater is. Ok, once again, I'm not much of a hat person but I loved how cute this is. I might look like a boy with it on, but we'll see how this goes once it comes in the mail. I have a couple of pairs of shoes that are a similar style but I have none that are a nice color. I love how these straps are a lot thinner and the price is amazing! I've been loving high-waisted jeans and you can never go wrong with a classic pair of black. I've never tried their denim before, so I'll be sure to tell you how I like them! You always needs a cute pair of comfy clothes. I told you I've been on a star kick and love this set so much. It even comes in a cute maroon color! I love skirts but need ones that I can wear to work. I love how this one is midi length perfect in and out of the office! The color of this dress caught my eye the most and I love the length. This will be perfect transitioning into Spring with a pair of cute sandals! This romper is one of my favorite. Although it's freezing outside I love this look with a mock turtleneck, black tights and over the knee boots. This is one I can't wait to come in! I hope you found something that caught your eye. If you've never tried shopping at Boohoo, I definitely recommend it. Definitely take advantage of the AfterPay option and snag a few more pieces to add to your wardrobe. If you need any help with sizing, let me know.